E.B. Tylor in his younger days. Edward Burnett Tylor was born in 1832 and at the age of sixteen joined his family's brass foundry. In 1855 he showed signs of tuberculosis and was sent on a trip to the United States of America, Cuba and Mexico. It was during this trip that he famously became interested in anthropological and archaeological matters. On his return to Europe he wrote his first book, Anahuac (1861), about his trip to Mexico. Tylor decided to devote his life to anthropology. Because of his religious status he was forced to undertake scholarly research and writing outside an academic institution. After the publication of his first book he familiarized himself with the growing anthropological literature making notes in books now held in the Pitt Rivers Museum's manuscript collections. His best known publication was Primitive Culture which was published in 1871 to great acclaim. In that same year he was elected Fellow of the Royal Society. Four years later he was awarded the DCL (an honorary degree) by the University of Oxford for his work. By this time he was well known as a scholar and writer, and his degree was widely reported in the press. He was what would be described today as an 'armchair anthropologist', that is, his evidence was, in the main, gleaned from other authors rather than direct experience. 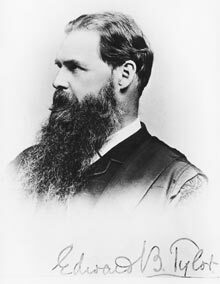 Following two public lectures on anthropology at Oxford in 1882, Tylor was chosen as the new Keeper of the Oxford University Museum of Natural History. He moved into Museum House (since demolished) and in 1883 he was appointed to the first anthropological academic post in the UK as Reader in Anthropology, required to give 18 lectures a year. His lectures attracted small but diverse audiences, including many non-academics. 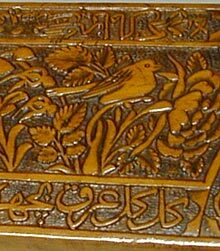 Iranian carved wooden stool. Owned by Edward Burnett Tylor and donated following his death in 1917 by his wife, Anna. In 1895 Tylor was appointed the first Professor of Anthropology at Oxford. The exact role that Tylor played in the work of the Pitt Rivers Museum (founded in 1884) is disputed. However, he certainly contributed to the study of anthropology at the University and he was also gave many donations to the Museum including the largest object in the Museum's collections, the totem pole from Masset which he donated in 1901. He seems also to have had a strong sense of fun and humour. Today, Tylor is remembered for holding the first academic post in the discipline. He is described by the Dictionary of National Biography (2004) as 'the father of anthropology'. He should also be remembered for the fine collection that he donated and bequeathed to the Pitt Rivers Museum. Marett, R.R. Modern Sociologists - Tylor . New York: John Wiley and Sons, Inc., 1936. Myres, John Linton 1953. [no title] in 'Anthropology at Oxford: the proceedings of the five-hundredth meeting of the Oxford University Anthropological Society ... February 25th, 1953. Stocking, G. 1987. Victorian Anthropology . New York: The Free Press.